The Echo was Amazon's first foray into smart home accessories, and even though it's since been replaced with a newer model, it's still a good product. With it, you can ask Alexa questions, listen to music and audiobooks, and call/message people. The cylindrical design allows audio to disperse in 360 degrees, and the sound isn't half-bad. 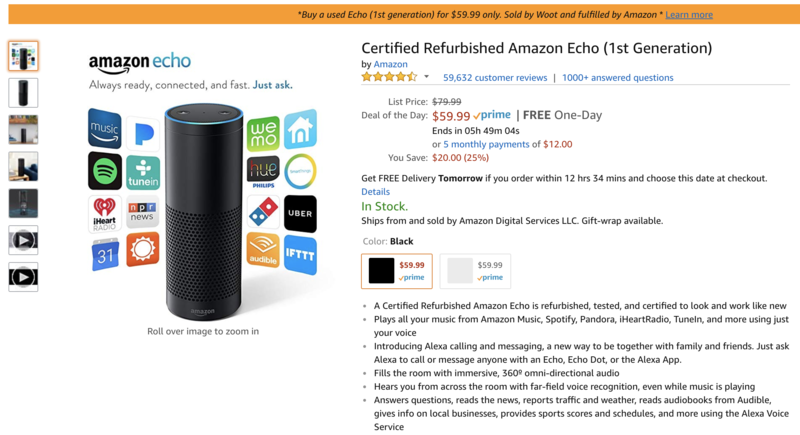 Refurbished Echos usually go for $79.99, but Amazon has dropped the price to $59.99 for today only. There are about 5.5 hours remaining as of publishing time, so hurry if you're interested. Expedited shipping is free. Hit the source link below to pick one up.